10G is now common in large enterprises. New network trends continue to drive the demand for high-speed Ethernet, such as the virtualization trend, network storage trend, I/O convergence trend, and data centre network aggregation trend. So 40G and 100G as well as corresponding equipment are introduced into the market. The migration from 10G to 40G/100G is inevitable. Before planning for migration to 40G/100G network, we should better know well about high-speed Ethernet. The following will talk about it from the side of standards. Because structured cabling systems design is always guided first by standards. The standards for 40G and 100G are significantly different from previous generations; active equipment and how information is transmitted are unique. First, it’s IEEE standards. IEEE creates the standards that define performance parametres. IEEE 802.3ba 40Gb/s and 100Gb/s Ethernet is the only current standard that addresses the physical layer cabling and connector media maximums for 40/100G fibre channel requirements. IEEE 802.3ba-2010 standard was approved at the June 2010 IEEE Standards Board meeting. The standard is shown in the following table. Second, it’s TIA (Telecommunications Infrastructure Standard). For data centres, TIA defines how to apply the parametres to structured cabling systems. It establishes design criteria including space and layout, cabling infrastructure, tiered reliability, and environmental considerations. The standard recommends using the highest capacity media available to maximize infrastructure lifespan. 1G and 10G networks use GBIC (Gigabit interface converter). For example, generally the transceiver SFP+ (small form-factor pluggable) is for 10G network. Later the fibre connectivity in high-speed active equipment becomes condensed and simplified. Transceivers for 40G and 100G are QSFP (quad small form-factor pluggable), CFP and CXP (100G form-factor pluggable). MPO/MTP is the designated interface for multimode 40/100G, and it’s backward compatible with legacy 1G/10G applications as well. Its small, high-density form factor is ideal with higher-speed Ethernet equipment. 40G and 100G Ethernet employ parallel optics. Data is transmitted and received simultaneously on MTP interfaces through 10G simplex transmission over each individual strand of the array cable. After introducing some basics of the high-speed Ethernet, we’ll discuss the structured cabling system of migration to 40G and 100G networks in the simplest and most-effective way. The system includes configurations for 10G to 40G/100G networks over 12- or 24-fibre MTP cabling. What’s the difference between the two methods? Which one is better? The sections will compare the two from the sides of migration, density and congestion. Migration To achieve the migration, components like trunks, harnesses, array cords, modules, and adapter plates are needed. With the 40G 12-fibre legacy configurations, a second trunk and another set of array harnesses will be needed to achieve 100% fibre utilisation (as shown in Figure 2). For 100G, it also needs these additional components with 12-fibre legacy configuration. But with 24-fibre trunks, a single cable can support a 1G-100G channel and simplify network upgrades immensely (as shown in Figure 3). When equipment is upgraded, there is no need to install new trunks. In addition, limiting changes can reduce the inherent risks to network security and integrity. Density The higher density connectivity, the more rack space for active equipment. Thus less floor space is needed. In this way, 24-fibre cabling has the obvious advantage. If the active equipment is configured for 24-fibre channel/lane assignments, there will be twice as as many connections with the same number of ports compared to 12-fibre. Congestion The more connectivity you are able to run in the same footprint, the more crowded it can become at the rack or cabinet. Fewer trunks reduce cable congestion throughout the data centres. Using 24-fibre MTP trunks for the cable runs will save half the number of cables versus 12-fibre in the network. Runs carry a lighter load, fibres are easier to manage, and improved airflow reduces cooling costs. So 24-fibre MTP trunks offer a huge benefit. The high-speed network will become more and more popular. It’s very important to know something about the migration to 40G/100G. To upgrade your network, 24-fibre MTP will be a better fibre cabling choice compared with 12-fibre. Do you prepare well for the great migration? 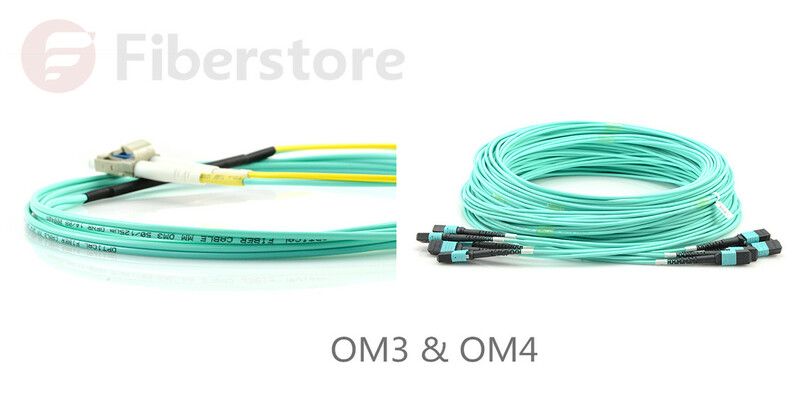 This entry was posted in Fiber Optic Transceivers and tagged 10G OM3, 10G OM4, 40G/100G, CFP, CXP, MPO/MTP, QSFP+ on February 24, 2016 by laura.